My father is self-professed bibliophobe, making holiday gift-shopping a difficult task for a book lover like me. The interesting aspect about him is that he loves information, but does not find books as the way to obtain this information. A constant listener to NPR and the Teaching Company’s lectures, a few years ago, my father began to rave about the audio book, The Banker to the Poor, by Nobel-Prize winner Mohammad Yunus. There were subsequently many dinner conversations focused on the concept of micro-lending: The practice of investing in people, rather than financial institutions, empowering its recipients to take control of their own future. 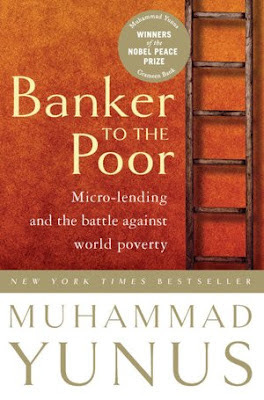 After mentioning my book challenge to my family, my father encouraged me to read The Banker to the Poor, stating that it offered many insights into its setting of Bangladesh. Indeed, although this book focuses on the development of the Grameen Bank, Bangladesh plays a central role. I was captivated by the book, completing it within two days. Not only did I learn about microcredit, but this book also led me wanting to learn more about Bengali history and society. Before this book, I had heard of the World Bank only in magazines. It almost seemed to me to be an institution above criticism. What is your image of the World Bank? Has the World Bank had a personal impact? According to this book, what are the positives and negatives of this institution? I found the Decisions of GrameenBank incredibly interesting. It prompts me to ask about the status of Bangladesh in the modern world. To those from this country, how important are these decisions to everyday life? If you could add to these, what would you add? Yunus has the goal to eliminate poverty. Based on personal experience, do you think that this can be achieved? Why or why not? The author describes the barriers to businesses that particularly manifest themselves in the western world. It is often very hard for someone to engage in business without incurring many costs. What is your personal experience to barriers to business? What is Yunus’s vision of globalization? How does this differ with your own vision of globalization? Please feel free to answer the questions I have posed, comment on the topics, or note something interesting from the book. I look forward to hearing your opinions!